The first English translation was done by Thomas McClatchie (1814-85), the Irish curate of Midsomer Norton in the Somerset coalfield, who went to Shanghai in 1844 as one of the founders of Church Missionary Society work in China. He became a canon of Hongkong cathedral and later of Shanghai. His thinking reflected his admiration for the writings of two Englishmen: the Cambridge Platonist, Ralph Cudworth (1617-88), whose philosophical idealism so readily harmonized with the Great Treatise; and Jacob Bryant (1715-1804), whose writings about comparative mythology encouraged the then popular theory that all human culture had roots in the Middle East. These themes are to the fore in McClatchie’s translation of Yijing published at Shanghai in 1876. It might have been gratefully received, had he not attracted scorn and loathing by his detection of phallic elements in the yin /yang theory, which he discussed in relation to the first two hexagrams. His brief mention of sexual organs was decently veiled in Latin, but he so seriously upset the Presbyterian Legge that the latter cried Proh pudor! and claimed McClatchie’s work was of no use. Legge’s prudery probably contributed to Wilhelms lofty dismissal of McClatchie’s work as ‘grotesque and amateurish’. Shchutsky, an admirer of Wilhelm, wrote of McClatchie’s ‘pseudo-scientific delirium’. As a result McClatchie’s work has been misrepresented and undervalued. William Edward Soothill (1861- 1935), Profesor of Chinese at Oxford, was one of the few who mentioned McClatchie without disdain. MacClatchie, however, never flinched from controversy. His Shanghai obituarist declared that ‘his temperament disguised his success.’ In 1874 he had published a book called Confucian cosmogony which was reviewed, severely and at length, in China Review by the Scottish missionary John Chalmers (1825—1900). 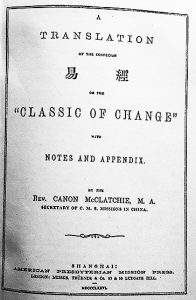 Chalmers and McClatchie were on opposite sides in the protracted debate on the ‘Term Question’ that divided protestant missionaries into fiercely opposing camps arguing whether the Chinese Christian term for God should be Shen or Shangdi. This inevitable replay of the Roman Catholic Rites Controversy began in the 1830s, soon after protestant missionaries entered China. It peaked about 1850, but hard feelings lingered. In September 1875, Ernst Eitel, the distinguished Lutheran editor of China Review (a member of the same mission as Chalmers), rather reluctantly printed McClatchie’s riposte to Chalmers’s review. In January 1876, with even greater reluctance, Eitel published another essay by McClatchie, entitled ‘Phallic worship’, with an editorial note stating that the article was printed solely in order that someone might refute it. No one did. 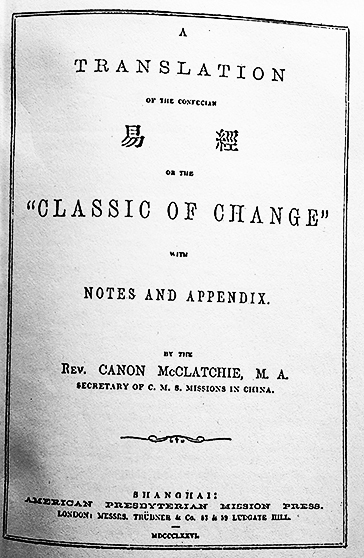 McClatchie’s Book of Changes appeared in Shanghai a few months later. There is much irony in this story. Clay phalluses have been found in Henan at sites of the Longshan period (third millennium BC), and primitive forms of written characters connected with ancestors are generally recognized as phallic graphs Joseph Needham has even interpreted the first two hexagrams as phallic pictograms, saying ‘Such interpretations are entirely in the style of ancient Chinese thought.’ (…) McClatchie’s version was soon overshadowed by Legge’s translation, published in London six years later. McClatchie, like Father Joachim Bouvet before him, maintained that the Yijing had been carried to China by one of the sons of Noah after the Deluge. But whereas Bouvet had tried to use the Changes to prove that the ancient Chinese had knowledge of the “one true God,” McClatchie believed that the work reflected a form of pagan materialism, “perfected by Nimrod and his Cushites before the dispersion from Babel.” He identified Shangdi (the ancient Shang dynasty deity) as the Baal of the Chaldeans and pointed to a number of cross-cultural correlations involving the number eight, including the total number of Noah’s family, the principal gods of the Egyptians, and the major manifestations of the Hindu deity Shiva. Although despised and scorned by colleagues mcClatchie’s translation remains a milestone in the history of the Yijing in the West. For reasons that I cannot fathom his translation has never been released to the public domain. I purchased a reproduction and made a pdf of it as I think this book should be accessible to all students of the Yijing. There are two versions: one very big file and one less big file. I tried to make the files smaller but failed utterly. The quality of the reproduction that I bought is poor and the files are a faithful reproduction of this lack of quality. Nevertheless the text is readable on all pages. If pages are missing or need to be rescanned please let me know. The copy that I purchased did not come cheap. Donations are welcome. McClatchie’s translation is indeed in the public domain, but it is assumed that the later editions more commonly found in library collections may contain additional materials like forewords and introductions that are not. Because it’s technically a bilingual material, digital libraries would require an archivist literate in Chinese to review and verify the copyright status of the entire volume before releasing it to the public. The first edition reproduced here is not under copyright. Hi Andrew, in the reprint there are no extra pages other than 2 pages that state it has been reprinted by SMC.